What’s New In Long Beach . . . The SupROpure under-the-sink reverse osmosis system from HOH Water Technology uses six treatment steps to purify the water. By utilizing a fluid logic manifold design, the SupROpure needs fewer water connections and attains a waste-to-product ratio of 2:1 or 1:1. It comes in either 15 to 50 gpd thin film composite models or a 15 gpd CTA model. The system comes complete with RO unit, three-gallon storage tank, faucet, and all fittings for installation. According to HOH, the SupROpure is easy to install and service through the use of the manifold and speed fittings. RUST OUT, a new product from Iron Out, removes rust stains from toilets, flush boxes, clothing, bathtubs, driveways, and even the surface of buildings , according to the manufacturer. Sold exclusively to the dealer specializing in the sale of water conditioning equipment, RUST OUTchemically changes iron oxide into a clear, soluble state that flushes away. RUST OUT can be used safely and repeatedly in all water softeners without harm to softeners, valves, tanks, or septic systems. A bottle kit from Pure One Systems converts a conventional bottled water cooler into a self-filling cooler with a permanent 5-gallon bottle. Compatible with reverse osmosis (RO) and carbon filtration, the kit eliminates the need for a separate water storage tank when used with RO. Other features include an internal shut-off valve and an optional .2 micron air filter. The kit has residential or commercial applications and eliminates the need for plumbing in most residential and many commercial installations. 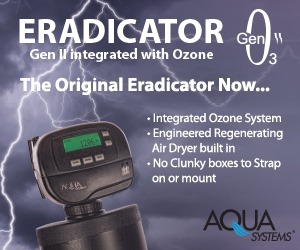 A compact wall-mounted one quarter pound per day ozone generator from Ozotech comes with dual channel control, adjustable air flow meters, video indicators, safety interlocks and an automatic regeneration air prep system that works without the added expense of compressed air. Using Ozotech’s patented corona discharge technology and capable of high concentrations of ozone, the unit is designed for cooling towers, large swimming pools, and industrial and commercial applications. Ozotech’s entry into the POU market, the Ozzie O3, is a countertop or under-the-sink three-stage system using a 5-micron prefilter, a GAC filter and ozonation packaged into a single enclosure. The system is demand activated and can treat several hundred gallons of water per day with no water waste. The Cartridge LifeTM and Filter LifeTM series of water meters and filters from Matt-Son is designed to monitor maximum gallon flow. Equipped with flow restrictors and illuminated red and green indicators to alert consumers when it’s time to change cartridges, they install over any faucet. Cartridge Life water meters will adapt to any OEM’s filter system where gallon monitoring is required and can be customized for specific OEM applications. Cartridge Life and Filter Life are trademarks of Matt-Son, Inc.
Mazzei Injector will exhibit a clear plastic model of their efficiency injectors that demonstrates the high mass transfer or dissolution rates possible when they are used for aeration or ozone gas injection. The model shows the aggressive mixing action taking place as air or gases are injected into its vacuum environment. This action creates small “micro bubbles” that greatly increase the surface area exposed to the treated water and optimize the mass transfer or dissolution rate. Recent independent tests have documented mass transfer rates with ozone gas as high as 99+%. A low pressure reverse osmosis (RO) system from KISS is designed for use with line pressure as low as 10 psi and includes a cut off to protect the pump if the pressure falls below that level. The pump delivers a constant pressure of 80 psi to maximize membrane protection. A brushless motor extends the life of the pump which carries a 3-year warranty. A built-in heater raises the water temperature to facilitate increased membrane production. The compact system, available in 10 to 20 gpd models, allows installation in the same space as a standard RO system. LaMotte Chemical has a new Corrosion Control Kit for municipal water operators. Model CCK testing outfit was developed specifically for determining corrosive conditions in water supplies which can introduce lead and other heavy metals from distribution systems. The test kit supports a water supplier’s lead in drinking water abatement program. Each unit includes tests for P and T alkalinity, calcium hardness, temperature, pH and orthophosphates. 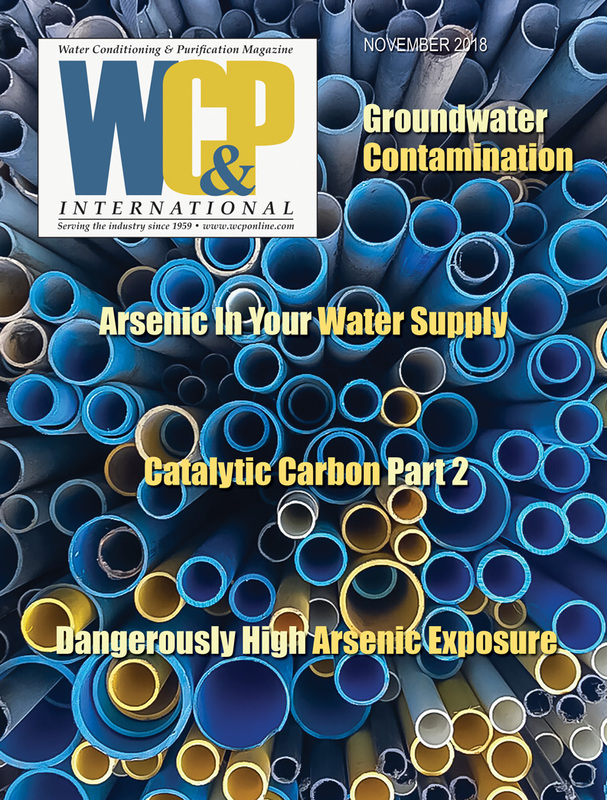 Results from other tests are combined to calculate a saturation index by the Langelier method to indicate the corrosive or non-corrosive nature of the water supply. The Purefill Water Bar from Pure Systems is a self-contained and self-service water purification and dispensing system. Designed for inside pay-at-checkout installation, the Purefill Water Bar connects to 110-volt power and low pressure water supply and can pass through standard doorways. All Purefill models feature National Automatic Merchandising Association listed water processing systems employing microfiltration, activated carbon, 1500 gpd reverse osmosis with thin film composite membranes, ozone and optional deionization. A 200 gallon built-in stainless steel storage reservoir ensures ample water supply for peak demand. The MATRIKX TM extruded carbon filters from KX Industries are designed for whole-house/point-of-entry (POE) water purification systems. The extruded activated carbon filters are available with rated flows from 2 to 20 gpm and a service life to 100,000 gallons. The MATRIKX filters fit all standard 20″, 30″ and 40″ housings designed for 2.50″ and 4.25″ diameter filters. The filters provide a high adsorptive capacity: the MATRIKX-1 filters with 1 mm filtration, the MATRIKX-5 filters with 5 mm filtration, and the MATRIKX CTOTM with 10 mm filtration. Touch -Flo will exhibit its new lead-free “S” class faucet. A significant investment in tooling has gone into the manufacture of this stainless steel faucet, according to the manufacturer. 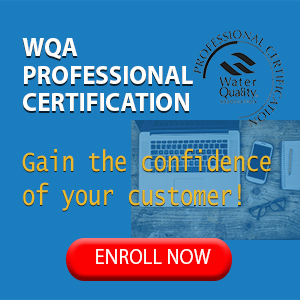 Models available include the 350S air gap model for reverse osmosis applications and the O-3S standard version for other ultra-filtration systems. The battery-operated DR/700 colorimeter from Hach is capable of measuring more than 75 common water quality parameters. It uses interchangeable electronically-programmed filter modules to provide direct-reading results for chemistries measured between 420 and 810 nm. Each customized DR/700 module contains the appropriate filter and factory-programmed calibrations to provide direct readout in concentration units, percent transmittance or absorbance for the selected module wavelength. One user-entered program can also be permanently stored on each filter module. Originally known as the compact rural, the patented CS series pump-driven reverse osmosis system from Water Factory Systems is designed to produce high quality water from difficult water supplies. Production rates are 30 gpd in CTA and 60 gpd in thin film composite. The systems come complete with installation kits and manuals, and a variety of pre-engineered storage, pretreatment and post treatment systems are available. Applications suited to the CS series include rural drinking water systems, office drinking water systems, ice makers, coffee makers, humidifiers, and laboratories. The All American Deionization Carts from Aries Supply are built with 5HP Honda motors with a range from 2 gpm to 3.5 gpm at 700 psi to 1500 psi. The positive displacement triplex ceramic plunger pump has a safety valve. The water quality control box shuts off the engine when the water quality is poor. The frame, which has dual holsters for storing guns and two heavy duty hose reels, accepts either three 8″ diameter DI tanks or two 10″ diameter DI tanks. Other features: safety guns, hoses and nozzles; a safety shut-off gun; 36″ wand; 75′ of pressure hose; 150′ of 3/4″ industrial quality low pressure inlet hose; a stainless steel nozzle with a 25- or 40-degree spray pattern; tubeless pneumatic tires; and industrial grade casters with locking brakes.. The Apollo drinking water system from International Water Technologies uses distillation technology to remove biological, inorganic and organic contaminants while providing 12 U.S. gallons of water per day. The solid state electronics offer the reliability of having no moving parts in the control system. An insulated boiling tank is incorporated for energy efficiency, and the heating element includes both a thermal fuse and thermostat to protect the unit from overheating. Other features include a mini preconditioner, automatic drain option, and an optional remineralization package to remove acidity and restore calcium in a controlled fashion. The Pure Water Machine from Coster Engineering offers a variety of models and options so the customer can order the machine that best satisfies the marketplace. Small in size, the machine is available in three reverse osmosis models, which are NAMA listed, as well as an activated carbon filtration model. The dispenser housing can accommodate one- to five-gallon containers. Cabinet dispensers and wall-mounted door assemblies are available to sell spring or bulk water. The L-1 Lead and Heavy Metal Cartridge from Clarity Filters uses a unique absorbent media to remove lead and heavy metal contaminants while providing water on demand. Independent laboratory tests conducted according to EPA- approved methods show lead reduced from 140 ppb to 5 ppb in 2,000 gallon tests. Clarity offers a wide variety of filter housings, cartridges and components aimed at the dealer, industrial and commercial markets. The Pure-TekTM Creater Series water cooler from VariKold uses the air with normal humidity as its source of water . Designed and developed by Water Systems Development, the cooler dispenses purified water yet requires no water source, no plumbing and no drain, according to the manufacturer. The unit needs only a standard 110 volt electrical outlet. The process combines methods of dehumidification, ultraviolet sterilization and the patented PureTekTM compact, deionization cartridge to produce the chilled water. The components have been certified by the Association of Home Appliance Manufacturers to draw 17 liters of water in 24 hours in 60% humidity, 70°F office-type environments to fill its 45-liter storage tank. The CDP 6000 RO booster pump from Aquatec Water Systems offers a continuous duty, low voltage motor with a proprietary brush design and an automatic pump by-pass for 5 to 35 gpd residential RO systems (Pat. Pending). The low voltage (24 VAC) plug-in power supply is available in 115 or 230 Volt service. The 1/4″ or 3/8″ straight or elbow fittings are standard. Pressure switches and accumulators are not required for operation. The smaller design allows mounting of the pump inside most countertop RO cabinets. Options: full-tank pump shut-off switch, automatic membrane flush control with optional built-in flow restrictor, leak detector/feed water shut-off valve, low input pressure pump shut-off switch, and solid-state level sensor control system. The patented Spring-Flo II Accessory Faucet Line from WPM is available in standard and air gap models with a choice of spout configurations. The air gap models provide backflow protection from either back pressure or back siphonage and meet all applicable codes and regulations. 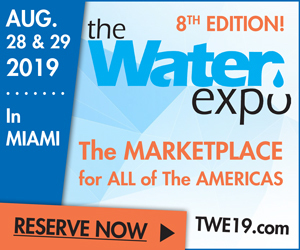 Options: polished chrome, white, almond, or all black; an electronic TDS monitoring module; the Tom Thumb Aerator® for splash reduction; a 3/8″ adaptor for product water supply line; conventional under-the-counter installation or above-the-counter Spring-Set® installation system.